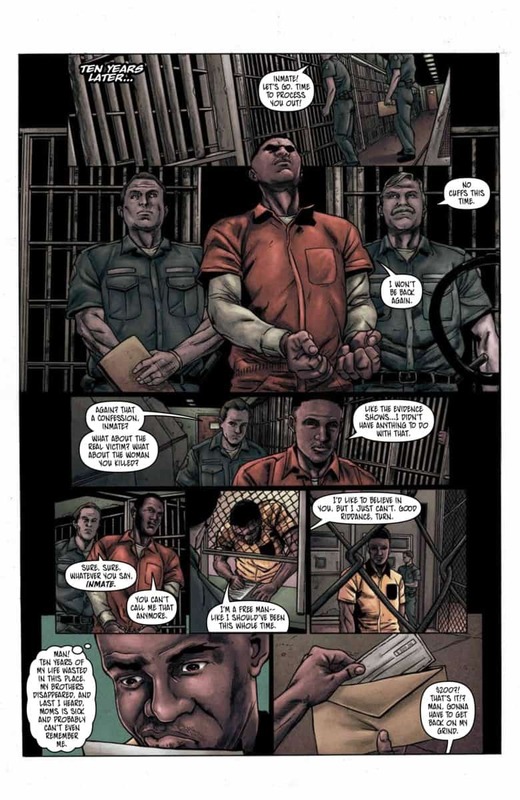 VINDICATION #1 tells an interesting story about race and the criminal justice system in America. A powerhouse story that resonates with today's current events. Racism, police brutality, and prison reform are issues that have plagued the United States for decades. 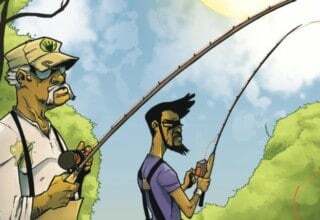 Comic writer MD Marie with artist Carlos Miko and Dema Jr’s VINDICATION #1 takes a bold look at existing social issues in an incredible story. It gives an interesting perspective into the terribly corrupt things that happen to people of color in the justice system. After Turn Washington is released from prison, a murder occurs with the same M.O. as the one that got him convicted. Determined to give Turn his last strike, detective Chip Christopher will do anything to prove that Turn is guilty. Did Turn commit the crime? We’re not so sure. But one thing is certain; VINDICATION #1 is a trippy ride that blurs the lines of race, power, and our corrupt legal system. 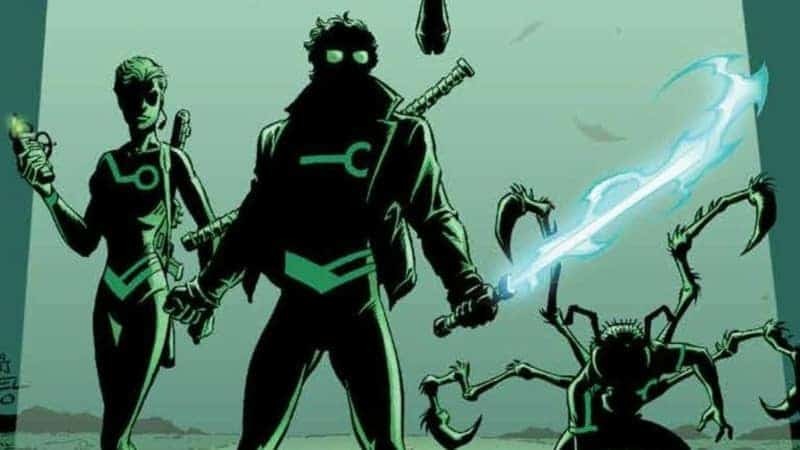 VINDICATION #1 is a must read for any comic fan. Turn Washington is an African American man who may or may not have killed someone. At the beginning of the story, he’s sentenced to life in prison without the possibility of parole. Ten years after his arrest, he is exonerated of all charges and set free due to lack of DNA evidence. Unfortunately, the same day Turn is free, a homicide identical to the crime that he was originally committed for occurs. Upon hearing of this heinous crime, Turn’s arresting officer, detective Chip Christopher, thinks that Turn is the prime suspect. Defying both his captain and Internal Affairs, Chip is hell-bent on proving that Turn is behind the recent murder. With a few anonymous tips, Chip begins fitting the pieces of the crime together in the hopes that they bring him closer to his main target, Turn. What unfolds next is a cat and mouse murder mystery with a combination of racism, corruption, and abuse of power. 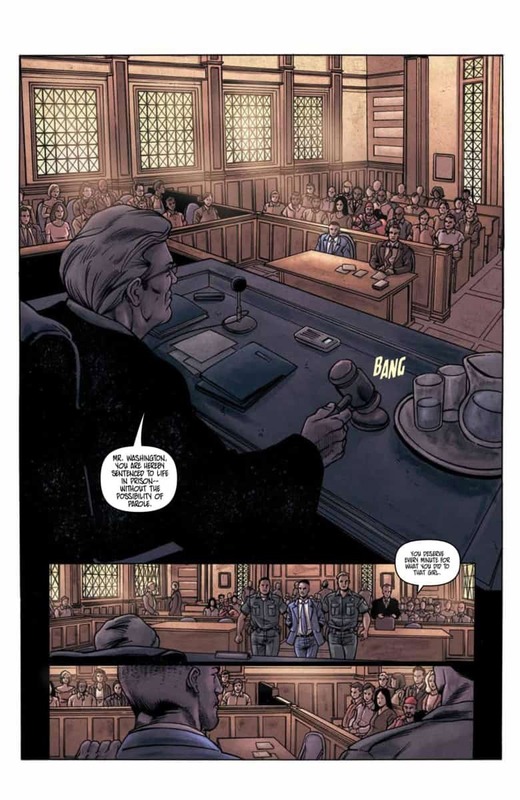 VINDICATION #1 is a fantastic story that does a good job at highlighting corruption in our legal system. In a short amount of time, it manages to touch on the most commonly known problem with our judicial system: bias racism. 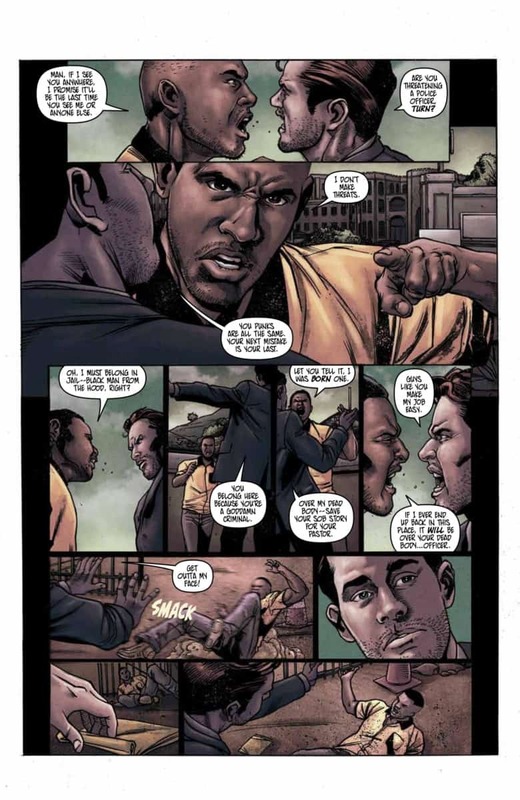 VINDICATION #1 has a lot in common with films like THE HURRICANE, LIFE, and THE GREEN MILE, which deals with wrongful convictions. Wrongful convictions are one of the biggest problem black men face today. What Is Vindication Really About? VINDICATION #1 touches on a number of topics including incarceration and the corrupt legal system. But it also highlights how the criminal justice system victimizes African American men. Marie does an excellent job at not only showing this issue but is also excellent at verbalizing it. Through her powerful choice of dialogue, with lines like, “Your kind always slips up,” or “You punks are all the same,” it’s hard to ignore our real issues within society. It’s an eye-opening look at how the justice system in America finds a way to keep black men oppressed. In addition, it also does a really good job of setting up the plot as well. 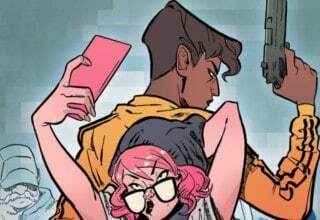 Early on in the story, crooked cop Chip Christopher is assigned a new partner named Maggie Cruz. Maggie seems like a decent cop that follows the rules. It’ll be interesting to see how Chip handles Maggie tagging along while he continues to try and sabotage Turn. Sooner or later Chip is going to slip up. Of course, the story isn’t the only good part of the book. 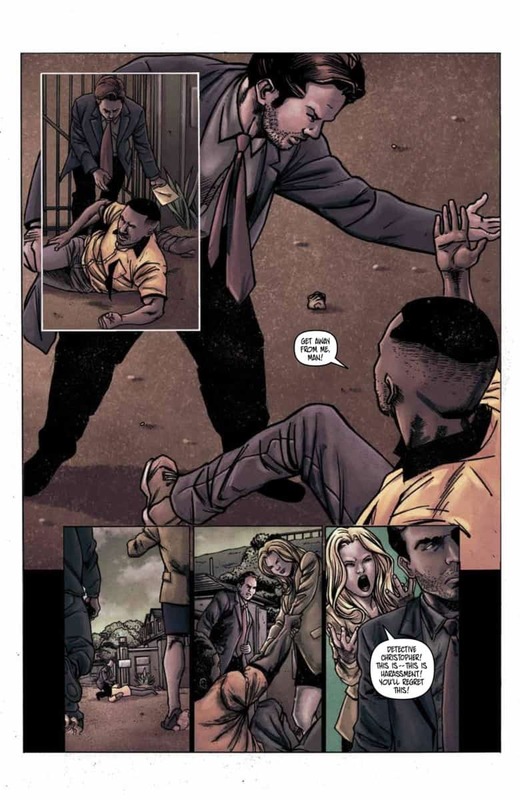 Artist Carlos Miko does an amazing job of bringing the corrupt world in VINDICATION to life. Miko’s pencils are pretty rough and rugged, which fits well for a story focused on struggle and hardships. His line work tells a story within itself on every panel. Colorist Thiago Goncalves’s amazing color work helps set the dramatic tone for the series. 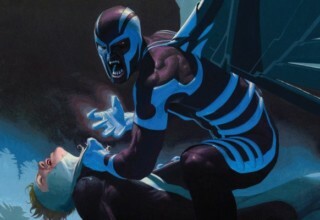 His choice of plain and dark colors gives it a serious but realistic vibe within the story. Turn leaves the prison wearing a bright yellow shirt which is a great move by Goncalves. 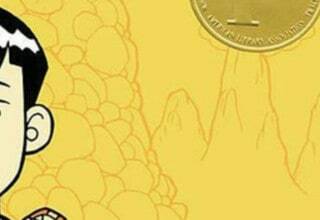 It serves as a great visual tool to draw the readers eye to Turn, making him the center of attention. His colors help detail the distinction between the characters. 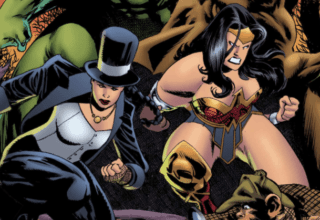 VINDICATION #1 is a strong start for this four-issue series. Only time will tell if Turn is, in fact, a killer or another victim of circumstance. Marie does a great job at using Turns presumed innocent to keep readers with a little doubt. The pacing is great, the dialogue is fantastic, and the pencil work is on point. Hopefully, we get to learn more about Turn and his past in the next issue.